Do you enjoy spending time outdoors and wish you had amazing patio furniture to enjoy? Well look no further, we have the best tips to help ensure that you buy the perfect outdoor patio furniture. When patio furniture is placed on your porch or patio, it creates the perfect outdoor room to enjoy during the warm months of spring and summer. Couple the furniture with rugs, pillows and other accessories for the perfect way to bring your patio or porch to life. We are going to look at the different types materials used in outdoor patio furniture, the benefits of each type of material, the price point, how to make it last and what to look for when shopping. If you live in a windy area, wrought iron is the best choice for you. This type of patio furniture provides you with traditional styling; however, it can be expensive. You should expect to spend between $400 and $5,000 for a four piece patio furniture set. When shopping for wrought iron patio furniture, try to lift it to ensure you will be able to rearrange it easily. You will also need to look at the underside of the furniture to ensure the joints are welded smoothly. Wrought iron can rust. You will need to use furniture covers or place it in a covered area to help decrease the risk of rust. Aluminium is a light weight and inexpensive choice for those who are looking for affordability and durability. The tubular design should be checked for smooth welds and be powder coated to improve durability and reduce the risk of rust. A four piece aluminum patio furniture set should cost around $700. Use furniture covers during the off season to help prevent cushions from fading and decrease the risk of pitting. Stone is one of the best materials for outdoors as it will last well and also takes very little care of maintenance – something a lot of others do. It may be heavy but it’s durable and looks great – check out these outdoor benches made out of stone as a case In point. Traditional wicker is not meant for outdoor areas. the natural fibers are wound around a metal frame and will not last longer than a year outdoors. For outdoor wicker furniture, opt for waterproof resin wicker. Look for realistic textures and a tight weave when shopping for this type of patio furniture. Shoppers should expect to spend around $700 for a quality set. 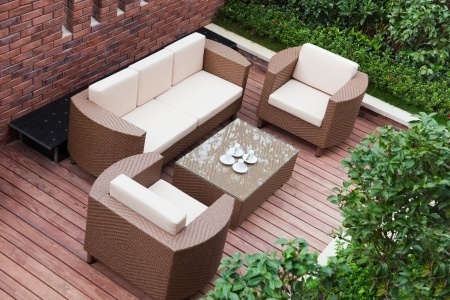 To increase the longevity of your waterproof resin wicker outdoor furniture by covering it when not in use. Teak wood is the premium outdoor wood furniture because it is weather-resistant and offers a timeless look; however, you can create a similar look for less with eucalyptus. You can expect to pay around $1,800 for a four piece teak set and $550 for a four piece eucalyptus wood patio set. Ensure the set has a smooth finish, rustproof hardware and is sturdy. If left untreated, the wooden furniture will weather to a silver-gray color over time. To keep the warm wood finish, apply a waterproof oil annually. If you are looking for affordable, weather-resistant and lightweight patio furniture, look no further than plastic patio furniture. You can pick up plastic patio furniture for as little as $10 per piece at your local home center, big box store or grocery store. When shopping for plastic patio furniture, shop for high-grade marine polymer or recycled materials. These surfaces look similar to wood patio furniture; however, it is weather resistant and does not need the upkeep that wood needs. Expect to spend about $5,000 for a four piece patio set made of the same material used for composite decking. Keep covered when not in use to keep it looking like new. I definitetly need to go with wrought iron furniture, mine is always blowing over. I had a table shatter once.